Flat roofing typically consists of multiple layers which is laid down in a series of layers and then torched down and heat welded. This type of roofing material is known as Modified Bitumen Membrane. The membrane is made of a fiberglass layer between layers of rubberized asphalt which is then topped with a layer of small ceramic stones. This top layer helps to protect the roof from the elements as well as reflect heat and UV rays. This type of roofing is typically used in commercial and residential applications. Flat roofing material resists oxidation and damage from UV rays. Flat roofing is durable, available in different colors, lightweight, and has a clean look. Flat roofing is easily repairable and weather resistant which is important for our climate in Toronto. Flat roof membrane roofing has been on the market for over 25 years. It has evolved from a single ply layer to the common two ply layer system used today. Industrial applications typically use a more labor intensive and heavier system using tar and gravel. This type of flat roofing is more expensive to install and repair. It requires special commercial equipment to apply. 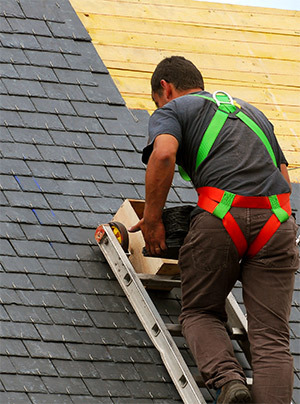 Our company will thoroughly evaluate your roof to determine your roofing needs. Our expert flat roofing contractors will check the condition of your roof to establish if your roof needs a repair or replacement. We will also check the insulation in the attic to make you have an adequate thickness to regulate your home’s temperature, and finally make sure your home has adequate ventilation to prevent the growth of mold and mildew which can damage your roof. 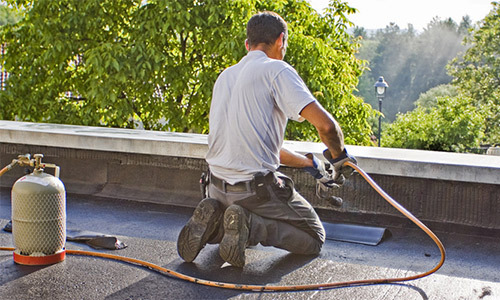 iRoofing Toronto provides customers with complete installation, maintenance, and repair of flat roofing systems. Because even a small level of damage can lead to more serious issues it is important to maintain your flat roof. We can set up an inspection and maintenance schedule to keep your flat roof in good condition. A properly cared for flat roof can last up to thirty years. Our expertise will ensure that your flat roofing system will be built to last. If you have any issues with your flat roofing we will make it right, we guarantee it. Our customers can count on us to provide them with value added services, the highest standard of craftsmanship, quality products, and a dedication to details that set us apart from the competition.